February is National Pet Dental Health Month, the ideal time to take stock of your furry friend’s oral hygiene. Although pets can’t brush and floss on their own, their mouths require the same TLC as yours. Here are four pieces of advice your veterinarian wants you to know about keeping your animal’s smile bright and healthy. Your pet’s diet has a significant impact on their health, including their pearly whites. There are many treats designed to clean teeth. These crunchy tidbits can remove buildup and prevent bacterial growth. Look for products with the Veterinary Oral Health Council (VOHC) seal. Also, give them chew toys, many of which are designed to work similarly. Just as you should brush your teeth twice a day, animals also need to brush daily. Otherwise, bacteria can accumulate and cause dental disease, which can lead to other health problems. Invest in specialty products, such as a soft-bristled toothbrush and flavored toothpaste made just for pets. It’s easiest to acclimate young animals to the habit, but old dogs and cats can get accustomed to it as well. Be patient and let them get used to you touching their mouth before using tools. If your pet is uncomfortable with a brush, you can put toothpaste on your finger and rub it gently on their teeth and gums. Pets also need regular cleanings, just like humans. Your veterinarian will check their teeth as a part of their annual wellness exam and let you know if cleaning is required. Older pets, in particular, tend to need cleaning once or twice a year. During the dental examination, your vet will also alert you to any issues so these can be fixed before they worsen. 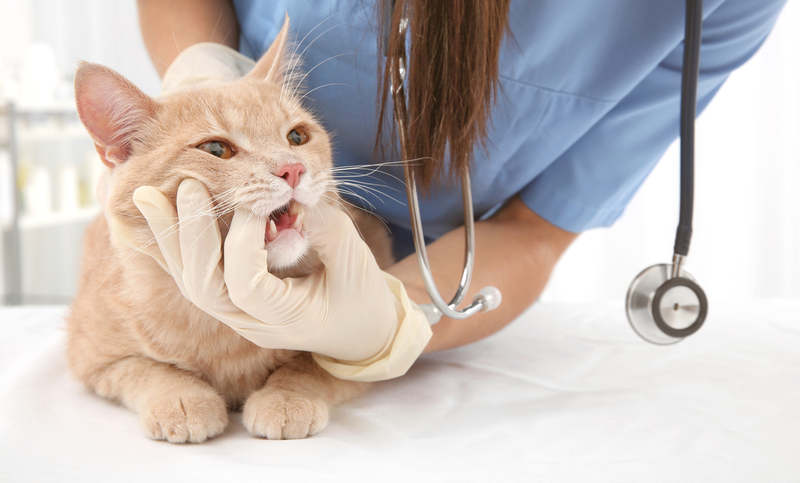 Between routine vet visits, keep an eye on your pet's health and look out for changes, such as red or bloody gums, chronic bad breath, irritability, or signs of pain when the head or mouth are touched. These may indicate problems such as gum disease or a broken or chipped tooth that need to be addressed immediately. If your pet has worrisome symptoms, call your veterinarian to schedule an appointment as soon as possible. A strong oral hygiene routine can help your pet live a longer, healthier life. This February, start 2019 off right by scheduling a dental checkup with your veterinarian. If you’re a Guilford County, NC, resident, turn to the compassionate, experienced professionals at High Point Veterinary Hospital. For over 20 years, this caring team of animal lovers has served the community, providing a range of services from pet grooming and boarding to surgery and spaying and neutering. Call (336) 889-3832 to speak with a friendly staff member or visit the website to learn more about how they can help your family.